A leather jacket is an attitude it is not just a coat. Marlon Brando in his famous movie The Wild One sprawled over his motorcycle and seizes the appreciation of the audience. His charm in the movie led to the charismatic image accompanying with motorcycle leather jackets. Unluckily, for most men, it takes more than just a jacket to project the tough and cool guy image. Remember a quality leather jacket is an only-one time investment, it does not matter how much you pay for the jacket if it doesn’t fit well. A well-fitted leather jacket should be like a second skin to you and it should fit your frame. Limit inner clothing to a minimum when wearing a fitted jacket. You don’t want to look like you have borrowed the jacket from someone. 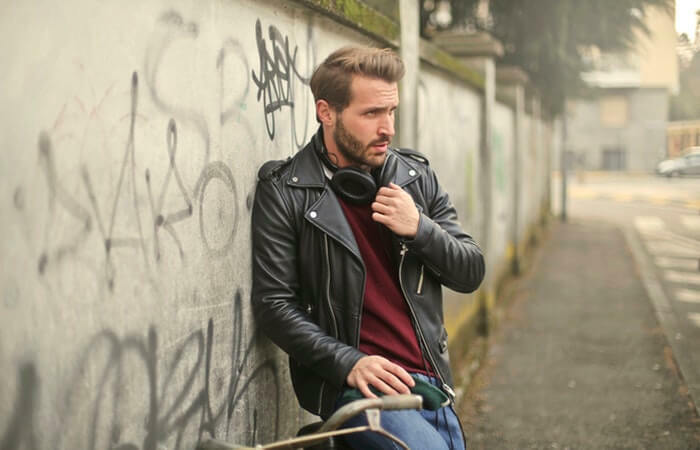 While buying a leather jacket you should consider shoulders, armholes, length of sleeves, and length of jacket, collar, and pockets. The skin manufacturer’s use in the making of jackets make all the difference, a texture of jacket varies from thin lambskin and buttery soft to thick and durable. Staying warm in cold climate is main criteria of leather jackets, the only difference lies in a lining. Light polyester lighter if preferable to warmer climate whereas woolen lining is best suited for the cold climate. Leather jackets are considered to be the toughest item in one’s wardrobe. A jacket should feel heavy while holding and it should be 1.1mm to 1.3mm thick. A leather jacket is the perfect piece of clothing for every season. With a diagonal zip and asymmetrical fastening, flared collar and large spreading lapels, these classic icons were introduced in The Wild One. While wearing any smart casual clothes like V-neck, t-shirts, dark denim jeans and button-down shirts you can wear moto racer jacket for a sportier look. Originally bomber jacket was designed for bomber aircraft crew. It has zip-up style with soft inner lining and is a waist-length coat. Cuffs and waist are with elastic. Utility jacket is initially derived from hunting jacket and is correlated to Fatigue Jacket. It has extra 4 pockets. For easy horseback riding cattleman leather jackets are designed with buttons instead of a zipper. It is classic for cattlemen and ranchers and usually found in rural part of the country. Instead of zipper it is designed with buttons and falls around the upper thigh area. Black Leather Duster is a split back version of an overcoat. It was used to safeguard outfits from weather and dust. This jacket falls into ultra-casual a lot; it is usually reserved for more street style. It is promoted by youngsters and it is known for fabric body and leather sleeves. Defining feature of this jacket is curved front with either one or two zippers. This leather jacket is inspired by traditional fencing outfit. To maintain leather jacket quality and to improve its durability toy have to take good care of it. Leathers are considered to be weatherproof but if you caught wearing it in the rain than allow your leather jacket to dry naturally keep it away from extreme heat. For decent lining and weatherproofing look for extra taping on interior seams. Use leather conditioner if you wear your jacket in rain by doing this it will restore its flexibility. You can also use saddle soap. For restoring leather jacket duster use leather oil. It can act as a substitute for natural oils which can be washed out by exposure to sun and rain. To keep the leather jacket supple and to extend its lifespan frequently use milk oil.